The OECD guideline for studies on percutaneous penetration to be used in hazard and risk evaluations prescribes experimental conditions with optimal barrier integrity of the skin, which in many occupational settings probably is not true. Thus, workers may have compromised skin due to chemical or mechanical damage, due to different medical conditions (eczema, dermatitis, skin irritation) or related to occupational scenarios involving prolonged wet work. The present study used the OECD guideline procedures to study the in vitro percutaneous penetration through human skin of a number of model substances (glyphosat, caffeine, benzoic acid, malathion) covering a range of solubilities. Further, we studied the extent to which a slightly damaged skin would change the rate, the amount absorbed during dermal exposure and the distribution of chemical deposition between epidermis and dermis. 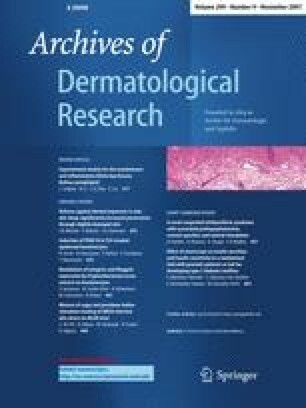 The present study demonstrates that a limited damage to the skin significantly increases the permeability coefficient (K p) as well as total percutaneous penetration of chemicals, and most significantly for those compounds that due to their physicochemical characteristics (the most hydrophilic as well as the most lipophilic) have low penetration rates through intact skin. The present experiment not only confirms the proportionality between lipophilicity and potential for percutaneous penetration, but also illustrates that at a certain degree of lipophilicity of a model compound, the different skin compartments become more attractive for temporary deposition of model compounds. Moreover, a clear change from epidermal deposition towards a dominating dermis deposition of chemicals temporarily deposited within the skin is seen following damage to the skin barrier. Thus, the distribution of chemicals within the skin compartments is affected by the physicochemical characteristics of the chemicals as well as by the integrity of the skin. This observation may have implications when evaluating the possibility of removing chemicals from the skin through different cleansing procedures following unintended dermal exposures. The study was funded by the Danish Environmental Protection Agency, programme on pesticides (#7041–0334). The authors are grateful to F. Lind for technical assistance with the experimental work.